Crucial MILSATCOM Solution FinN-ished, An in-house communication network was scaled from an initial small network to a large communications hub. Norsat has provided satellite communication equipment and services for the Finnish Defence Forces since 2009. Prior to Norsats involvement, the Defence Forces were using an external network providerhowever, they needed a far more reliable solution. The need for geospatial intelligence is stronger than ever. Across domains, experts are discussing better methods for collecting, exploiting and sharing geospatial information. DISA: 2000-2010 COMSATCOM Info Released To Stakeholders..., The Annual Report provides a detailed account of DoDs annual COMSATCOM bandwidth usage and expenditures. 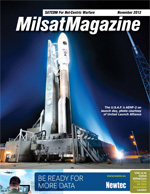 The Department of Defenses (DoDs) Commercial Satellite Communications (COMSATCOM) Annual Usage Report is widely regarded as the authoritative source for information on DoD COMSATCOM expenditures and bandwidth usage. This is an introduction to the challenges, opportunities and advantages associated with Software Defined Radio (SDR), particularly within the field of satellite communication (SATCOM), and more specifically in relation to Inmarsats currently most advanced IP-service, the Broadband Global Area Network (BGAN). With a rapidly growing global market for satellite communications and an ever increasing demand for bandwidth, Ka-band is coming of age. Ka-band is being hailed as the next step for satellite communications as a Ka-band satellite can support significantly greater volumes of traffic than its C- or Ku-band counterparts.